This is a diagram of all the vibrational modes ('absorption bands') of the Earth's atmospheric gases; in the near infrared range of the electromagnetic spectrum. Gases are detected by thermoelectric thermopile or bolometer detectors (below), 'what is incorrectly termed 'IR spectroscopy'; and by thermoelectric's complement, Raman (Laser Lidar) spectroscopy (above). 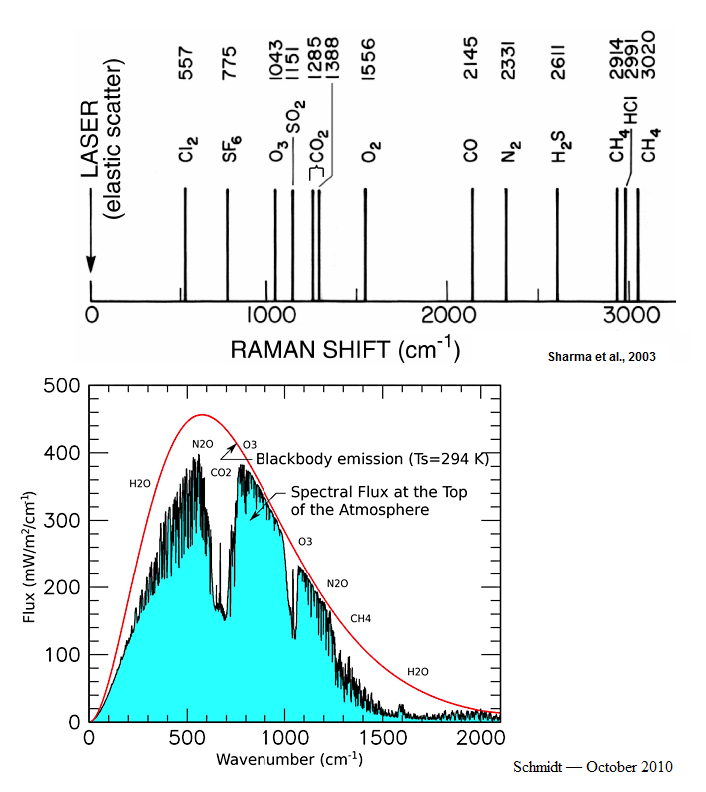 Notice O2 and N2 (some 99% of the dry atmosphere) are only detected by means of Raman spectroscopy. This is due to them both having their one (and only) vibrational mode being non-thermoelectric: they both have only symmetric vibrational modes, with no electric dipole moments to generate, by the thermopile, an electric charge, and so are not detected. Notice the other greenhouse gases, CO2, CH4, and O3 with symmetric modes figure by Raman also. N2 and O2 have been wrongfully assumed non 'greenhouse gases', and this needs to be reviewed. The so called greenhouse gases have wrongly been interpreted, and are really the thermoelectric gases, only detected by thermoelectric (thermopiles).